The Global X Lithium & Battery Tech ETF (LIT) is a comprehensive and well rounded ETF that invests in the total lithium cycle. Right from the beginning of the supply chain at the mining level, through to refining and battery production. It commenced trading in July 2010 and its primary exchange is the NYSE Arca. The advantages of this ETF is that it provides access to a broad basket of companies aligned to the Lithium sector. Lithium is commonly known for its use in lithium batteries yet it is also in high demand in relation to manufacturing heat resistant glass and ceramics. Yet it's the projected widespread adoption of lithium batteries in emerging technologies that has most investors interested at the moment. Top producers globally include Australia, South America (Chile & Argentina in particular) and also China. 'In Elliott Wave speak, Wave-(2)'s typically retrace into the 50.0% – 61.8% pullback area which in this case aligns 27.92 and 24.79 respectively. Thus far price has tagged a low of 25.72 so it was no real surprise to see buyers start to have a nibble again when this price zone was entered into.' What we now need to see though is more convicted upside follow through off this low point. We have seen price action progress higher, yet overall it has been quite choppy and corrective in look and feel. Price also didn't appear at all comfortable the closer it made it's way towards the 200 day moving average which it clearly continues to reject off. We are now back to oversold and retesting the upper boundaries of the 28.00 – 26.00 support zone. So if buyers are going to return, then now is as good a time as any for them to do so from a technical perspective. This could easily go either way ! 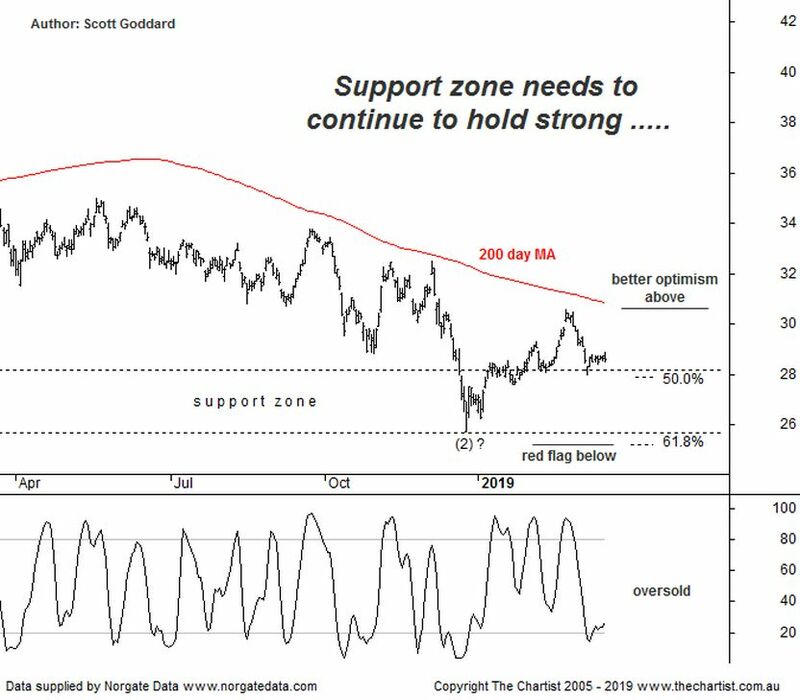 Based on our analysis there is scope for traders who are interested, to consider taking on aggressive long positions if the support zone continues to hold strong moving forward. The higher swing low trigger would be the more conservative approach and the best one under the circumstances. Considering we still have question marks as to whether a major low point has locked in or not. A swing above 30.56 that sticks will also take price back above the 200 day moving average which it hasn't been able to achieve for over 12 months. It might be worth starting to put some of those beaten down ASX Lithium stocks onto your watch list to keep a close eye on over the coming weeks and months. Editor's note: Australian lithium miners are among the most shorted stocks on the ASX.